It's funny how certain things stay with us, and effect who we are, or at the least our perception of who we are. 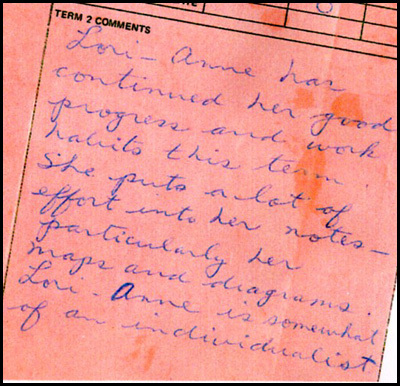 I was in grade six when written in my report card was the sentence, "Lori-Anne is somewhat of an individualist." Big word, for a girl of eleven...and I can't say I knew what it meant, or if I wanted to be one! It was too soon for me to know, or accept that I really didn't have a choice, or that more than thirty years later; it would remain a pivotal moment in my life. I know at the time, I, like all of my peers, just wanted to fit in. "Sameness" was cool, and apparently this teacher thought I was somehow different. It scared me a little, as I did not know this was a good thing and meant to be taken as such. Just like in grade six, hair and hormones do whatever they please, and emotions often run amuck. The innocence of that time is long past and I have learned much about the cost of trying to fit in, when I know I will always be a little different. It's not easy always being a little on the outside, and I am still surprised and somewhat naïve when it comes to my own originality, and its effect on the world in which I live. Did I seek to be different, independent, or even what some might call a little eccentric? Nope. Did I revel in being the one to cause a bit of a stir every once in awhile? Of course! I still do! It's fun to bewilder and even shock the masses every once in awhile! Can you become an "individualist"? You are already an individual, unique and separate in your own right, so why not push the envelope...just a little bit? Next time, in say...an introductory situation, where you are probably just supposed to say "hello, I'm Lori, nice to meet you"...try a big hug instead! You never know how its going to feel, how long it will need to last, or what it could lead to! Whatever your thoughts on those who are, perhaps nonconforming, remember that you too are unlike any other human being on the planet and also have the ability to show your own bit of quirky self. Add amusement and pleasure to the journey we are all on and seek to be different! Have a terrifically unique and wonderful day!